On a day when the JD(U) severed its ties with the NDA, the BJP-led coalition's key partner Shiromani Akali Dal's patron Parkash Singh Badal today said his party was "solidly" behind the BJP and did not believe in “interfering” in their internal matters. The Congress high command today rehabilitated former Chief Minister Capt Amarinder Singh by making him a permanent invitee to the top decision-making body of the party — the Congress Working Committee (CWC). The Public Works Department (PWD) is gearing up to initiate work on the four-laning of two important national highways allotted to it by the Union Ministry for Road Transport and Highways. Chief Minister Parkash Singh Badal today directed all the three state universities to work in coordination with the government's higher education development programme to bring uniformity in their academic activities. One of Asia's biggest wetlands, Keshopur Chamb, is set to get a fresh lease of life with the Punjab Government sanctioning Rs 8.10 crore for its revival. The Department of Tourism and Cultural Affairs has already finalised technical bids following which the process of financial bidding has started. To save power and prevent overexploitation of underground water, the Agriculture Department and agro-scientists are pushing hard to promote the direct sowing of paddy. But, the farmers are not much interested in this technique due to problems like those of weeds, which they fear might lead to less production. The mortal remains of veteran CPI leader Satya Pal Dang, who was in the forefront of the battle against terror in Punjab, were consigned to flames with full state honours here today. Politics over memorials refuses to die down, at least for the moment in Punjab. After the debate over the Operation Bluestar and Delhi anti-Sikh riots memorials, there is a related issue that has united the traditional opponents the Congress and the BJP. Sangrur MP Vijay Inder Singla today said the climb-down of the SAD-BJP government on property tax had vindicated the Punjab Congress’ stand that a “bankrupt government was trying to raise revenue by fleecing the people under the guise of a directive from the Centre”. The Punjab Government has directed that an FIR be registered against Janak Raj Mehrok, Joint Secretary of the Punjab School Education Board (PSEB), for allegedly appending fake signatures to certain records to overcome legal hurdles in his appointment. Rampant encroachments in the city and stray animals on the roads are not only leading to several accidents but have also become an eyesore. The authorities are aware of these two problems but admit that they are under a lot of pressure from politicians to not act against the offenders. 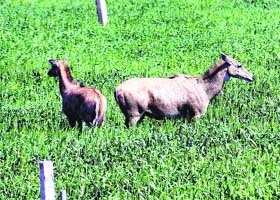 Farmers in parts of Patiala district, including Rajpura, Samana and Nabha, are up in arms against the state government and the Wildlife Department for not helping them protect their crops from wild animals. Some farmers continue to cultivate the old PAU 201 variety of Basmati rice as it is high yielding. The Agriculture Department has been urging them to cultivate the new seed called Pusa Basmati 1509. The new seeds can be cultivated in 115 to 120 days and required lesser water. The Agriculture Department’s plan of encouraging farmers to diversify and grow maize may not see the light of day. Heavy rainfall in the district has made it difficult for farmers to prepare the fields in time for the monsoon that is likely to arrive early. The American Gurdwara Parbandhak Committee (AGPC) has urged the Sikh Gurdwara Parbandhak Committee (SGPC) to amicably resolve the controversy over the amended Nanakshashi Calendar. It said all Sikh outfits across the globe should be taken into confidence before introducing any amendment in the calendar. To appease the Sikh community, the ruling SAD has constructed a number of Sikh historical monuments, including Virasat-e-Khalsa in Anandpur Sahib, Wadda Ghallughara in Sangrur, Chota Ghallughara in Gurdaspur and Fateh Burj in Chappar Chiri. But no progress has been made with regard to a martyrs’ memorial (dedicated to Mai Bhago and 40 Muktas) on the Tibbi Sahib road in Muktsar whose foundation stone was laid on May 4, 2005. Following the scrapping of the Management Entrance Test (MET) by Punjab, it has now been decided that all the universities across the state will independently hold admissions to MBA and MCA courses this year. The fall of the rupee against the dollar has brought cheer to the city's garment exporters and cycle manufacturers. " The depreciation of rupee will have a positive impact on garment exports. We are already getting a good number of orders from the US," Suresh Kansal, a garment exporter, said. Sarwan Singh Bhagupur, the main accused in the murder case of Patti Youth Congress leader Sukhraj Singh Bhagupur, who was arrested by the Patti police yesterday, has been sent to three-day police remand. The accused was produced in the court of Duty Magistrate Ravinderjit Singh Bajwa here today. A 35-year-old woman Harpreet Kaur of Bhawanigarh, was hospitalised when acid was thrown on her last evening. One of the accused, Mangat Ram of Dirba, was arrested today while search for the other two is on. The five-time Chief Minister asserted, “Akalis were with BJP solidly and will continue to be so.” Badal claimed all will shake hands with BJP after the general election. “Though every party, including the JD(U), has its own interest uppermost in its mind, yet all will shake hands with BJP after the general election,” he told reporters at Khatti village here. “The real combinations will emerge after the Lok Sabha poll," the 85-year-old Akali veteran said. His reply came when reporters asked to comment on the JD(U)-BJP rift, besides its implications on the NDA prospects. The veteran Akali politician claimed the BJP will emerge as the single largest party after the next Lok Sabha elections as “voters will reject the Congress”. "Voters will prefer throwing their votes in 'khuh' (well) rather than voting for the Congress,” he said. He also did not see much possibility of emergence of a Third Front. On whether he had approached the JD(U) or other BJP allies in the wake of recent developments within the NDA, he said, “Although I want that all the NDA partners should go along cordially, I haven't approached any ally..."
When asked that clouds of “disintegration” of the NDA had started looming large after the BJP anointed Gujarat Chief Minister Narendra Modi as the party's election campaign chief, Badal said "the SAD was with the BJP solidly and will continue to be so". He said that neither the BJP nor the SAD has ever interfered in each other's internal matters, which has further cemented the alliance between the two. To another query, Badal said building a memorial for terrorism victims could disturb the state’s hard-earned peace. He was reacting to a demand by the Congress for having a memorial for those killed in Punjab during the dark days of terrorism. On regional parties being brought under the purview of the Right to Information Act, he said he was not against the idea “but the process will complicate the situation”. Badal refused to agree with the Congress’ contention that panchayat elections would disturb the schedule of the farmers during the paddy season. 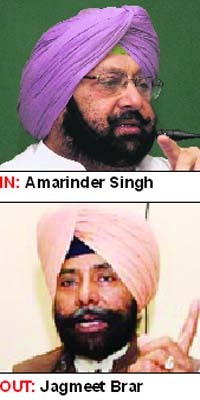 He also said neither he nor his deputy Sukhbir Badal will intervene in the elections. The CWC reshuffle also saw Ambika Soni, senior leader and Rajya Sabha member from Punjab, becoming a major power centre. She has been appointed as the general secretary in charge of Jammu and Kashmir, Himachal Pradesh and Uttarakhand and will also be the general secretary in charge of the Congress president's office. The All India Congress Committee (AICC), however, has delivered a snub to former MP and senior leader Jagmeet Brar, who no longer remains a CWC member. Besides being a special invitee to the CWC, Brar was also in charge of a few states. The Congress has also put its faith in youth leaders, two of whom have been appointed as secretaries in the new-look AICC. Sources said though the party had rehabilitated Amarinder Singh, who was in a limbo for a brief span after the elevation of Gurdaspur MP Partap Bajwa as Punjab unit chief in March, it stopped short of giving him a more effective role despite speculation that he would be adjusted as a general secretary. The AICC reshuffle is bad news for Jagmeet Brar, who earlier lost the race for the Punjab Congress Committee (PCC) chief’s post to Bajwa. The senior leader had become active in the state recently. Party sources are reading Brar's ouster as a signal that the party wants to strengthen the new PCC president at this crucial juncture. The Congress high command has also chosen to ignore other senior leaders, including former Chief Minister Rajinder Kaur Bhattal, and has shown faith in the youth. Prominent Hindu leader and three-time legislator Ashwani Sekhri and Congress vice-president Rahul Gandhi's loyalist and Fatehgarh Sahib legislator Kuljeet Nagra have been made secretaries. The party has also chosen to appoint Jalandhar MP Mohinder Singh Kaypee as special invitee to the CWC. By doing so, the party has chosen to give due representation to the Dalit community in the AICC. Party observers said besides rehabilitating Amarinder, which was necessary keeping in view that the former CM still wielded considerable influence in the state Congress, the reshuffle has Rahul Gandhi's stamp all over it. According to a formula that has been much discussed, the party has gone in for a Dalit, Jat Sikh and Hindu combination while choosing Kaypee, Nagra and Sekhri. The three also represent a generational shift in Punjab politics, which, sources said, has been supervised by Rahul Gandhi. After the reshuffle, Amarinder Singh expressed his gratitude to Congress president Sonia Gandhi for inducting him into the CWC. The Public Works Department (PWD) is gearing up to initiate work on the four-laning of two important national highways allotted to it by the Union Ministry for Road Transport and Highways. These are Amritsar-Bathinda national highway via Verka-Tarn Taran-Mudki-Kotkapura-Baja Khanna-Jida and Jalandhar-Moga-Barnala-Khanuri (Sangrur). "We have completed most of the paper work and the process is on to acquire land for widening the 175-km-long Amritsar-Bathinda highway, a project worth Rs 1900 crore. Documents have been submitted to seek mandatory clearances from the authorities concerned in the Centre. The project will have a bypass at Nehurashara Pannua, Zira, Harik, Talwandi and Kotkapura," said Ashok Singla, Chief Engineer, PWD. He said: "We have set the timeline to allot the tenders in September. The work on the Jalandhar-Moga-Khanuri highway is expected to start by the end of this year". "We have planned the widening of these highways in such a manner that these would actually become expressways. There will be flyovers, railway over-bridges (ROBs) and bypasses to overcome traffic bottlenecks," said Singla. "The Jalandhar-Moga-Khanuri (Sangrur) highway will extend up to Jind in Haryana. However, the PWD will deal with the portion falling in Punjab. These projects will be toll based and constructed under the public-private partnership (PPP) mode". 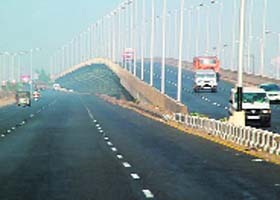 Most of the highways are constructed under the supervision of the National Highway Authority of India (NHAI). However, in Punjab, the Union Ministry of Road Transport and Highways, has allocated three highways to the PWD. As contractors have been facing problems in getting raw material for widening roads and other development works, the government is likely to issue short-term permits for mines, which they would have to identify themselves to extract sand, gravel etc. "We have a policy to lease out mines, but the person(s) concerned has to pay the average auction price to take a mine on lease," said a senior official of the Industry Department. He said at present, there was a policy to give short-term permits to brick kilns. 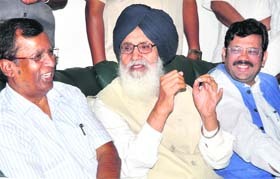 Badal yesterday presided over a meeting of officials of the universities and of the Education Department. Education Minister Sikander Singh Maluka, Vice Chancellors Dr Jaspal Singh of Punjabi University, Dr Ajaib Singh Brar of Guru Nanak Dev University, and Prof Arun Kumar Grover of Panjab University were present at the meeting. Badal asked the universities to adopt a uniform pattern of semester system, curriculum and choice-based credit system along with similar admission procedures that would facilitate the students in case they migrate from one university to another. He also asked the VCs to start the online admission and fee deposit system to avoid undue harassment to the students. To bring a revolution in the higher education, Badal directed the Principal Secretary, Higher Education, to chalk out a comprehensive plan in coordination with all the universities for imparting free higher education, including hostel and other facilities, to intelligent students belonging to poor families with rural background. He directed all the Vice Chancellors to identify key areas to enable youth to get successful employment after the completion of their vocational training. The Chief Minister also approved setting up of community colleges in the state to impart skill-oriented education of diploma level with multiple futuristic opportunities for preserving and upgrading traditional skills. He also approved the proposal to set up four such colleges on pilot bases under this programme at Government Mohindra College, Patiala; SDC Government College, Ludhiana; Mehar Chand Polytechnic, Jalandhar; and Government Polytechnic College, Bathinda; from the forthcoming session. The wetland, spread over 850 acres, attracts migratory birds from as far as Central Asian countries. Ornithologists had been expressing concern over the deplorable condition of the wetland, following which the state government prepared a plan for its revival. The project, which is to be jointly implemented by the Ministries of Tourism, Wildlife, Forests and the Gurdaspur district administration, aims at developing the area as a major eco-tourist spot by conserving its ecology and simultaneously generating revenue by providing employment to locals. Deputy Commissioner Abhinav Trikha, who is coordinating efforts amongst various ministries, said: "Thousands of migratory birds used to visit the area during winters either in search of food or to escape the severe weather conditions in their native habitat. However, due to several reasons, which include both natural and manmade, the birds had stopped coming. We will spend Rs 10 lakh on planting 3,000 saplings over a period of three years while Rs 35 lakh will be spent on removing weeds". A tourist interpretation centre (TIC) is also being established at a cost of Rs 71.58 lakh in Matwa village. The centre will have exhibition and administrative areas, a seminar hall, a souvenir shop and a cafeteria. 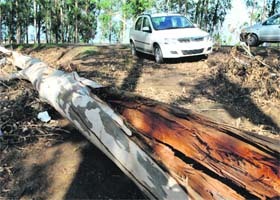 An 8-km-long nature trail is also being constructed at a cost of Rs 22 lakh. However, officials are concerned over the condition of the road leading to the wetland from Gurdaspur. The road is full of potholes and the work to re-carpet it is yet to commence even as the PWD authorities had floated tenders for the same in October last year. 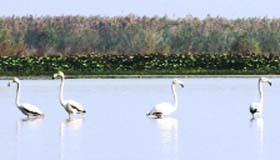 Though the funds earmarked for infusing a new life into the struggling wetland seem adequate, ornithologists say since too many agencies are engaged in the work, there may arise a problem of coordination. Another problem is the shortage of sowing machines. 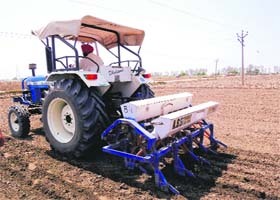 The government has so far provided one machine in each block under the Agriculture Technology Management Agency (ATMA) programme of the Union Government. More machines are needed to be provided to the farmers through cooperative societies to overcome this problem. Baldev Singh, a farmer of Talwandi Bhangerian village, who is directly sowing paddy for the past three years, said the growth of weeds was one of the biggest problems in this method. He keeps himself in regular touch with agro-scientists to control weeds from time to time. "I have to use weedicides to protect my crop", he said. Farmers demand that to avoid the threat from high weed infestation, they must be provided with information on herbicide resistance management strategies and crop rotation. Some farmers observe that weeds emerge in different flushes and create problems in direct sowing of paddy. Most farmers are also not well versed with latest herbicides and technique of herbicidal application. Some farmers are not aware of new technology and face difficulty in direct sowing and good crop stand. Dr Jaswinder Singh Brar, an agro-scientist, said the farmers needed technical knowledge for direct sowing and to control the problem of weeds. "The farmers should spray recommended herbicides/weedicides immediately after sowing paddy in the fields and another dose after one month to protect their crop", he said. Dr Brar claimed field tests during the past five years had proved that there was hardly any effect of weeds and the production was equally good as compared to the traditional method of paddy cultivation. Hundreds of mourners, including family members, friends, admirers and leaders across political spectrum, bade a tearful adieu to him at the Naraingarh crematorium. While no senior politician from the ruling Akali Dal was present, hundreds of Communist party workers and leaders, including CPI national secretary Amarjit Kaur, paid tributes to Dang. Prominent among others present were former Punjab minister Laxmi Kanta Chawla (BJP), Congress leader Rajkumar Verka, former Vidhan Sabha Deputy Speaker Darbari Lal and District Congress Committee chief Jugal Kishore Sharma. Additional Deputy Commissioner Jasbir Singh laid a wreath to pay tributes to the veteran leader on behalf of the state government. Anil Dang, nephew of the communist leader, lit the pyre as a contingent of Punjab Police reversed arms and fired shots in the air as a mark of respect to the departed leader. The CPI youth brigade, comprising boys and girls wearing red shirts and holding red flags, also attended the funeral. Earlier, a large number of people thronged Dang’s house to pay their last respects. Later, the body was kept in the party office for public to pay homage. Dang, a firebrand leader of the student movement, died here yesterday after protracted illness at the age of 92. He was elected four times to the Punjab Assembly from Amritsar. He was also the state Food Minister in 1967. At the height of terrorism in Punjab in the 1980s, Dang was vocal and active against the forces of secession. His wife Vimla Dang, also a CPI leader, died in May 2009. The couple, who had waged a relentless fight for the downtrodden, opted not to have any child as they did not want to divert their attention from people's struggle. Both these parties want a memorial set up in the memory of the around 25,000 persons killed during the dark days of terrorism in Punjab. The SAD, however, appears opposed to it. Congress spokesman Sukhpal Khaira has urged the SAD-BJP state government to also consider constructing a befitting memorial for the innocents killed during terrorism. Punjab BJP president Kamal Sharma and its national executive member Manoranjan Kalia also said they were "in principle" in favour of having a similar memorial. A memorial to mark the Operation Bluestar has already been built at the Golden Temple while foundation stone of a memorial for those killed during the 1984 riots is Delhi was laid recently in the national capital. Khaira said the memorial should be constructed as a mark of respect towards humanity. "The memorial can be on the pattern of 'The National September 11 Memorial and Museum' built in New York (USA) to commemorate the September 11, 2001, attack," he said. Kalia said he had raised the issue twice in the state Assembly. Chief Minister Parkash Singh Badal, however, claims such a memorial may vitiate the state peace. Sources said the Education Department has in a letter to the PSEB Secretary referred to the report of a probe into the matter. The probe was conducted by Director General of School Education Kahan Singh Pannu. The letter said information on the action taken against Joint Secretary Janak Raj Mehrok be sent to the government. Mehrok is reported to be the seniormost joint secretary of the board. It was alleged that Dr Kurian, Director, Trinity College, Jalandhar, and SCERT Director Sadhu Singh were shown as present at certain meetings of the Rules and Regulation Committee and the board even though they had not attended these. Their signatures shown on the relevant records were allegedly fake. When contacted, PSEB Secretary Balwinder Singh confirmed that the letter had been received. However, he said, all documents relating to the matter, including a copy of the probe report, were not attached to the letter. He said the board would decide on the next course of action in the matter. Most of the encroachers are supporters of a political party. The party has influence in three Assembly segments of the district - Pathankot, Sujanpur and Bhoa. There have been occasions when the district administration has removed encroachments on the busy Dhangu Road and the main bazaar but things have always came back to square one. To compound matters, stray animals block most busy roads in the town and lead to frequent accidents. Recently, a delegation of residents met Sujanpur MLA and Punjab Deputy Speaker Dinesh Babbu who in turn had reportedly met Deputy Commissioner (DC) Siben C to find a lasting solution to the problem. Raman Bhalla, a former minister, said that an NGO-Human Rights Manch- came forward to establish a shelter for animals. Siben C reportedly assured the NGO that it would be provided with one acre of land where it could construct the shelter. Not getting any assistance from the Wildlife Department, farmers have to keep vigil round the clock to save their crops. The farmers seem to be stuck in a complex situation as on the one hand, they are not allowed to kill or trap wild animals as per the wildlife laws, and on the other, getting compensation from the authorities is proving to be difficult. He complained that the procedure to get clearance from the Wildlife Department to shoot wild animals is very lengthy. Farmers in forest belts complain that neelgai and wild boars damage a lot of their crop and cause them huge losses. The problem is more serious in Rajpura where scores of animals can be seen in the fields even in the day. Some farmers have illegally fitted electric wires near their farms to keep wild animals away. Recently, hundreds of farmers from the nearby town of Nabha and Samana had held a dharna and complained about the menace of wild animals. The state government had issued a notification and allowed the hunting of wild boar for dome stic consumption in December 2009. But, hunters alleged that Sub Divisional Magistrates and wildlife officials took a very long time to issue hunting permits. The older seed Pusa 1121 takes 145-150 days to cultivate and is the most popular Basmati variety among farmers. Gurdev Singh, a farmer, said per acre yield of the PAU 201 was high compared to other varieties available in the market. He said he had been sowing this seed for the past one decade and had been getting good remuneration for the harvest every year. However, wholesale dealers maintained other varieties of paddy seeds that took lesser time to cultivate, PUSA 44, PUSA 1121, were selling well. Pusa Basmati 1509 was developed recently by the Indian Agricultural Research Institute (IARI), New Delhi. Narinder Singh, a farmer of Madofal village, said if the new variety fetched better remuneration in the local and the international market, they would cultivate it. A senior official of the Agriculture Department said as underground water was depleting fast, they had been urging farmers to grow the new variety of Basmati rice. He said that about 10 to 15 per cent farmers had already shifted to green house farming and were able to get better remuneration by selling their produce directly to multinational companies. The department expected that 85,000 hectares of land would be under paddy this season, he added. The department had set a target of facilitating the cultivation of maize on 4,500 hectares. It was to provide subsidy of Rs 40.5 lakh on 900 quintals of maize seed worth Rs 1.62 crore. Concerned about the depleting water table in the district, the department had been holding seminars at villages, urging farmers to grow other crops. This had started yielding results as many farmers had assured officials of sowing maize that offered better remuneration. Gurdev Singh, a farmer, said those who have sown maize must regret their decision as the recent rain would have harmed their crop. District Chief Agriculture Officer Jasvir Singh Bains said if it continued to rain for the next few days, farmers would not be able to prepare the land for maize cultivation. Yesterday, the Pakistan Sikh Gurdwara Parbandhak Committee (PSGPC) had aired similar views. It has been at loggerheads with the SGPC over the calendar issue since the last over two years. As a result, it has been observing various Sikh rituals as per the original calendar. While the SGPC observed Guru Arjan Dev’s martyrdom day on June 12, the PSGPC commemorated the occasion today at Gurdwara Dera Sahib in Lahore. Speaking to The Tribune on the phone from Pakistan, AGPC coordinator Pritpal Singh said Akal Takht Jathedar Giani Gurbachan Singh should work out a consensus among various bodies to end the confusion. PSGPC president Sham Singh said Sikh outfits all over the world should be taken in the loop before finalising key issues related to the Panth. 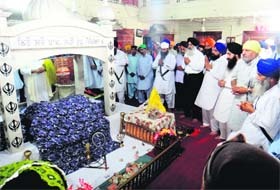 The then SAD president Parkash Singh Badal and the then SGPC chief Bibi Jagir Kaur had laid the stone of the memorial. Since then a number of meetings have been held in this regard by SGPC members, but the memorial is nowhere in sight. Last year, SGPC president Avtar Singh Makkar had claimed that the construction work would be completed before Maghi in 2013, but the fate of this proposed memorial is still unclear. Earlier, there was a plan to change the location of the memorial, but that did not materialise. Makkar said: "The memorial will come up within a short period. A committee formed in this regard is working on its design and after its finalisation, the construction work will begin". Local residents allege the SGPC and the SAD had laid the foundation stone of the memorial to compete with the Congress, which had laid the foundation stone of Mukt-e-Minar in Muktsar at that time. Separate notifications for the two courses have been issued to each university of the state by Principal Secretary, Technical Education. It clearly spells out that while admission to MBA is to be conducted on the basis of CMAT, for MCA, it is to be done on the basis of merit at the graduation level. All the universities of the state, which had been conducting centralised admissions to all MBA/MCA seats in the state for almost a decade, are going separately this time. These include Punjab Technical University, Punjabi University, Guru Nanak Dev University and Punjab Agricultural University. Till last year, each participating university had been conducting admissions to the two courses for a period of two consecutive years on a rotation basis. The PTU had conducted admissions last year and it was to conduct the admission this time as well. This had been objected to by the authorities of other universities. The PTU’s notification (uploaded on its official website) lists out only the names of its 101 affiliated colleges of management, 15 integrated colleges and two affiliated colleges in the evening shift. The names of other universities and their affiliated colleges are missing in the PTU notification. The decision clearly means more discomfort to the students who would now have to run around and keep themselves updated about various deadlines in the hunt for a better seat. AR Talwar, Principal Secretary, Technical Education, said that he had issued separate notifications after all the state universities had unanimously resolved to conduct admissions separately. “The VCs of these universities had held two meetings in September and November last year after which they conveyed their unanimous decision regarding holding admission independently to me on June 3. Their argument was that the process of centralised counselling was lengthy and tardy, resulting in the loss of good students," he said. Another garment exporter Vinay Sood said that overseas customers were aware of the rupee fall and in turn were demanding discounts. "So it will be only short-term gains for exporters because of the fall in the local currency," he said. The present scenario is also proving a boon for the domestic cycle manufacturers.The rupee fall has restricted large-scale import of bicycles from China. "Because of the rising US dollar, the import of bicycles has come down," said Gurmeet Singh Kular, president, United Cycle Parts and Manufacturers Association. Sukhraj was allegedly shot dead on May 8 at his native village, Bhagupur. A case was registered against five persons. Sukhwinder Singh and Harcharan Singh, two of the accused, were arrested a few hours after the crime. Paramraj Singh Umarnangal, DIG, Border Range (Amritsar) had declared that Sarwan had no role in the case. This had led to widespread resentment among Congress workers and leaders. She was admitted to Bhawanigarh Hospital but was later shifted to Government Rajindra Hospital, Patiala. Sanjiv Goyal, Station House Officer (SHO), Bhawanigarh police station, today said a case was registered against Mangat and two unknown persons on the statement of Harpreet Kaur. The SHO further said Mangat, who knew Harpreet Kaur, along with two other persons went to the victim’s house and threw acid on her. They then fled on a motorcycle.